Jerusalem - The Egyptian government on Monday evening proposed a cease-fire between Israel and the Palestinian groups in the Gaza Strip, according to which the two sides would end “hostilities” as of 9 a.m.on Tuesday. Prime Minister Binyamin Netanyahu is to convene the security cabinet early Tuesday morning to discuss the proposal. Diplomatic officials said that Netanyahu was expected to encourage the other seven members of the security cabinet to accept the proposal, which would return the situation in Gaza to what it was before Operation Protective Edge began a week ago. Foreign Minister Avigdor Liberman and Economy Minister are expected to oppose the proposal in the security cabinet, but are unlikely to be able to prevent the forum from accepting it. Some 48 hours after the cease fire goes into effect, Egypt is to convene representatives of both Israel and Hamas for further negotiations. “The effectiveness of their rockets have been neutralized, their storehouses and manufacturing capabilities have been hit, and they have been caused deep frustration because of the effectiveness of Iron Dome,” he said. In addition, he said, Hamas failed in effort to carry out attacks by land air and seat, and is at a low point in public opinion in Judea and Samaria, the international community, the Arab world and even inside Gaza. Israel, the official said, would now work in the international arena for the dismantling of the rockets and the closing of the tunnels. According to the proposal, the Palestinian factions would cease all “hostilities” emanating from the Gaza Strip against Israel. The Egyptian initiative calls for reopening the border crossings into the Gaza Strip to passengers and goods as the security situation becomes stable. It also calls for receiving representatives of the Israeli government and the Palestinian factions in Cairo within 48 hours after the cease-fire goes into effect to discuss “confidence-building measures” between the two sides. The Egyptians, according to the plan, would hold separate talks with the Israelis and Palestinians in Cairo. Israel’s government had no immediate comment on the Egyptian proposal. US Secretary of State John Kerry is likely to fly to Egypt Tuesday to hold talks with senior Egyptian officials, Egypt’s official MENA news agency reported on Monday, amid stepped-up international diplomatic efforts to bring an end to the ongoing terrorist rocket fire. Kerry is currently in Vienna for talks with Iran over its nuclear program. Israeli officials also would not confirm reports that Kerry was coming to the region. Kerry, according to the MENA report, spoke on Sunday with Egyptian Foreign Minister Sameh Shoukry, as he did with Prime Minister Binyamin Netanyahu. Kerry also spoke Sunday on the sidelines of the talks in Vienna with his counterparts from Germany, France, and Britain, as the EU issued a statement calling for a cease-fire. German Foreign Minister Frank-Walter Steinmeier is scheduled to arrive Tuesday and meet – among others – with Netanyahu, Palestinian Authority President Mahmoud Abbas, Foreign Minister Avigdor Liberman, and Justice Minister Tzipi Livni. In addition, Italy’s Foreign Minister Federica Mogherini will also arrive for talks on Tuesday, and Norway’s Foreign Minister Borge Brende will come the next day. Each of those visits was not scheduled in advance and is a result of the current crisis. Diplomatic officials in Jerusalem were not saying what Israel’s conditions for a ceasefire are, but have indicated that Jerusalem will not agree to the type of agreement that put an end to Operation Pillar of Defense in 2012. 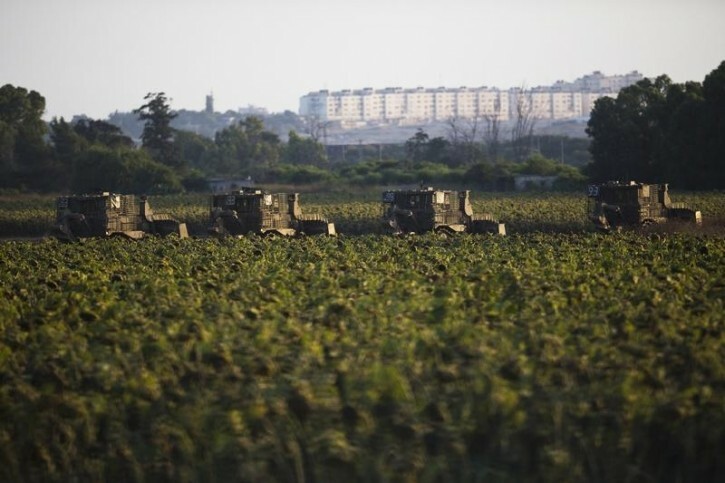 Netanyahu has said repeatedly in recent days that the goals of the operation are to restore long-term quiet to the country’s cities and significantly damage Hamas’s infrastructure, and that those goals could be attained either militarily or through diplomatic means. Differences of opinion inside the cabinet have emerged publicly as the talk of a cease-fire gets louder. Economy Minister Naftali Bennett (Bayit Yehudi) said during an interview on Channel 2 that Israel is “grinding Hamas, their officers, the terrorist activists, their homes, their tunnels. They are absorbing a very hard blow. Transportation Minister Israel Katz (Likud) said Israel should hold out for a deal that includes the demilitarization of Gaza. Meanwhile, the PA said Monday the countdown for reaching a new cease-fire between Israel and Hamas has begun. The official claimed that Hamas has been under heavy pressure from Palestinians in the Gaza Strip, who have “paid an unusually heavy price” during the fighting. Hamas and Islamic Jihad officials reiterated their readiness to reach an agreement that would end the current fighting with Israel, but have conditions of their own. Islamic Jihad leader Ramadan Shalah said his organization would agree to a new truce with Israel if the “aggression” on the Gaza Strip stopped and the border crossings are reopened. Shalah said the only party that could play a role in achieving a truce is the US administration. He added that without Egyptian mediation, it would also be impossible to stop the fighting. Channel 10 reported that one idea being floated was for the PA to take control of the border crossings with Egypt, which would then be opened. Meanwhile, the visits by the European foreign ministers come amid signals reaching Jerusalem that at the regularly scheduled EU foreign ministers meeting at the end of the month, there are those who want a strong statement that would not only deal with Gaza, but also slam Israel for settlements, dragging its feet in the peace process, and not allowing Palestinian development in Area C.
An indication of European thinking came Monday in London when British Foreign Secretary William Hague called in Parliament for Israel and Hamas to implement an immediate cease-fire. Israel, he said, had suffered sustained barrages of rocket fire from militants in Gaza and, he emphasized, is entitled to defend itself against indiscriminate attacks against its civilian population. The people of Gaza, he added, have a fundamental right to live in peace and security. Hague expressed great concern over the number of civilian deaths, saying that some 80% of those killed were civilians a and a third were children. Hague said international efforts are being made to broker a cease-fire, but with Egypt no longer having the influence and contacts with Hamas he indicated that other Arab states including Jordan and Qatar were involved in trying to bring about an agreement. He declined to say which other countries. During the 80-minute session, numerous MPs pressed Hague to call on Israel to halt its operation, but besides suggesting Israel should show restraint he studiously avoided using the word proportionate even when challenged to do so. However, he repeatedly made clear that Israel has a right to defend itself and he was equally adamant that Hamas has to shoulder responsibility for firing rockets at Israel from civilian areas. The only mild warning he had for Israel was to make sure its actions were within the requirements of international humanitarian law. Both sides have to distinguish between civilian and military targets, he added. Unbelievable. Well we can't say this was unexpected. Bibi is again going to bow to world pressure just when we are in a great position and the enemy is close to being decimated. Don't stop now! Wipe them out first and let them keep begging for mercy. They started it, now we must end it---after their annihilation. Stopping now would be a disgrace and would require Israel to re-visit this battle, indefinitely, within a year or so! Having said that, I could understand Israel's (globally isolated) position! You guys are so thirsty for Bibi to continue because you don't your children on the front lines. The only way to continue is with a ground war and it could cost Israel many, many lives. No one knows how bad it can get. And even then, it may not solve the problem, or even bring a bigger one - such as managing the lives of terrorists. You are also not counting the cost of the war, which is very high for every missile launched and bomb dropped. Yes, we will meet in another war again, it's inevitable, but let's be happy now with the gains we got. Come on, Bibi--show some guts--make your brother A"H proud!! I like the way everyone is saying "finish the job" there's nothing we can finish here, with millions of Arabs around the world that want to kill the Jews and destroy the holy Land of Israel it's not a battle we will finish ever and the only one who can finish the job is moshiach, lets hope he shows up real soon. have the PA control the Egyptian crossing? Weren't they thrown out of Gaza in an armed revolt - great idea! Why not have smurfs and martians control the border too! I agree with #4 - a bad peace but no dead or chalila captured soldiers. I think the government should leave tanks and soldiers on the ready for a while as the Hamas thugs are not to be trusted. For Pete's sake they are telling the world Israel threw the first punch - Chacham einov brosho - any honest person knows they have been launching rockets since the last cease fire! are any of you veterans of the israel military? It is unfortunate how Bibi is acting like a spineless Republican. Shame on him for giving up and strengthening the enemy. There are no gains, unless you consider an emboldened and fearless enemy certain to restart the fight at the time of their choosing to be a gain. Regarding your implication that the only people entitled to an opinion are the ones with close relatives in danger: your "logic" is no different from that of the feminists of the particularly rabid type, who hold that men have no right to an opinion on abortion because men don't get pregnant. You are in good company. Israel was not the one who started the war. Israel wants to live in peace. Israel is a thriving country - both ruchnius & gashmius. Israel knows a lot more about it than a bunch of couch-potato-american-warmongers. There is no reason for Israel to go to war unless it is under security threat. I am sure Netanyahu knows what is a threat & what is not. They already know that the Hamas leadership is in shreds and that they have used up 1/3 of their weaponry. The Israelis have been keeping track of exact locations of where the bomb making factories are & supply houses etc since they left Gaza in 2012. Part of this agreement would be that a full disarmament of the terror organizations in Gaza will occur, with the Israelis destroying the terrorist weapons with oversight from Egypt / UN, although the first step is a ceasefire. Firstly, learn the word "anonymous", say it correctly, then learn how to spell it. Your poor spelling suggests a shortage of learned knowledge. I should have known from your screen name that your comment would not be too bright. There is so much that Israel can do without costing lives. I dare to say that their knowledge of military strategy as well as the location gives them better judgment than you'll ever accumulate. The world opinion, reflected by the asinine comments from the UN agencies, is against Israel, and draws moral equivalence to the targeting of launchers and rockets by Israel to the civilian targets by Hamas. To kill more civilians in Gaza will not change anything. I do not suggest targeting civilians, just the targets that are surrounded by human shields (though questioning whether they are human altogether is justified). Israel will probably respond to pressure from Obama y"sh, and protect the enemy. Israel supplied them with fuel, and today with electricity (which they destroyed), and humanitarian aid. No Muslim known to this planet would do anything humanitarian for an Israeli. Let's work with facts, not wish lists. IMHO, from a military point-of-view, it does NOT make sense to accept a Cease-fire while it's very likely there will be another WORSE flare up in the not-too-distant future. I would be very worried about ongoing battle during the "Three weeks", which begins tonight. Traditionally, Jewish "Mazel" is at a low ebb during this period. If at all possible, I would recommend Israel avoid conflict for the next 3 - 4 weeks. It is easy to say "go to war" when it's someone else's husband, father or son. War is always a "lose" "lose", maybe we can find some sane people who go for a "win" "win" - as in business or just a quiet cold truce. Bibi is just too soft. This is not just a question of Israel's survival, the survival of the world is at stake, lest the Moslems destroy all of us infidels in the name of their "holy prophet"
To all those who shout, "Finish the job!" Have no idea what they're saying.....it's easier said than done. In the end of the day it will only be DONE when Moshiach will come! So continue praying that it happen speedily. "Israel can always go back if this fails...Nothing to loose Only to Gain by holding off"
Israel just DID go back and do it again because the same kind of phony " truce" from 2012 failed. Doing it again now because of world pressure is foolish. They must finish the job now! “ Israel was not the one who started the war. Don't be ridiculous, Israel won't be able to make any "demands" or conditions for the ceasefire becaue it's obvious they've already decided to agree to one. Hamas has won. They have the courage and nerve to ask for conditions, and they have: they want all their prisoners released. And you can be sure world pressure will make Bibi cave and give in to all hamas's demands for ceasefire, watch and see. For shame. “ IMHO, from a military point-of-view, it does NOT make sense to accept a Cease-fire while it's very likely there will be another WORSE flare up in the not-too-distant future. You're so right. Thank you for bringing our attention to a serious consideration that I'm sure most of us didn't think of.
" I agree with #4. At this point we b"h did not suffer any casualties. We always can come back, and probably will have to in the future, to destroy them again from the air if necessary"
What exactly does Israel gain then by waiting now and having to do it later? This already happened in 2012 with a ceasefire then too. And now Israel is back in the same spot going through it again. Don't you think it's time to finish the job once and for a all? Robert, and also Tax #16, read the second paragraph of my post #14, it's speaks about you too. Finish the job? What job? How do we know when we finish? Keep going until .... what exactly? I have never heard a rational list of the Israeli objectives in all of this. It is not punishing the killers of those poor boys, they have already been caught. It is not to kill the Hamas leadership. The Israelis say they do not know where they are hiding. What is the goal? How do we know when we have reached it? I agree with #12. As General of the Army Douglas MacArthur once stated "The soldier prays for peace". This current conflict does not benefit anybody, on either side. It is absolute madness to continue the present policy. There has to be a political solution to this problem, once and for all. Case closed! Disagree with no. 4. Shouldn't the citizens under fire be the ones to decide whether they're willing to stand for this terror again? Don't you think that they had enough of living in constant fear and are eager to live normally like all citizens of democracies???? They probably would prefer finishing Hamas and its weapons capabilities once and for all!! The Lubuvitcher reba said it best. In 73, Israel was one day away from damscus but caved in due to world pressure. The reba said they were foolish. "Der UN vet shrein sai vsai velin zie shrien a bissel hiecher"
Whats left out I am sure is that all 250 prisoners captured since the kidnapping will be freed. “ Finish the job? What job? How do we know when we finish? Keep going until .... what exactly? Huh?? You say "the killers of the 3 boys have already been caught?!" What are you talking about?? No it wasn't left out. Hamas has already made clear thats one of the conditions that will have to be met in order for them to "do Israel the favor" of agreeing to the ceasefire! You can be sure Israel will be asked to make this "confidence-building goodwill gesture" while hamas will give nothing, other than agree to (temporarily) stop the roocket fire.